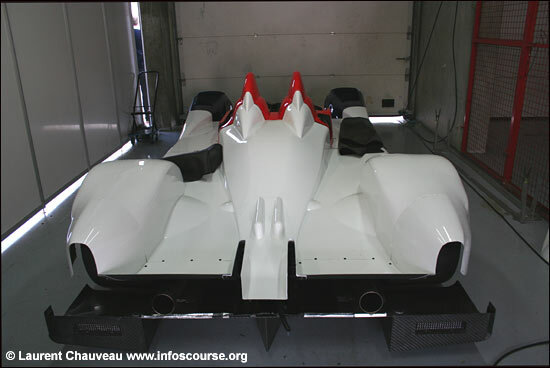 Laurent Chauveau spotted this car in a garage at Magny-Cours this week, and confirms that it is the M-Tec (Mugen) powered example, which is destined for the Japan Le Mans Challenge. This LC70, powered by the same 4.5 litre Mugen V8 as found in the factory Courage LMP1s, was suggested by dsc here, over two months ago. The first round of the Japan Le Mans Challenge is scheduled for May 14 (coinciding with the Le Mans Series Spa 1000 Kms).